No matter where you do business, the contacts that you build relationships with will be essential to the success of your enterprise, which is why our busiest department is the one networking and generating business meetings in India for our clients. Selecting the right partners to work with, the importers and distributors, advertisers and public relations specialists, and all the other individuals and organisations that will take your Indian venture from concept stage to profitable reality is a complex and time-consuming process. Eurobrands has a team dedicated to discovering who your company should be doing business with. Then starts the rather delicate process of approaching them for you, establishing a relationship, determining which are the best of the best, and then generating business meetings in India for our clients to cement these partnerships in person. When our clients are not able to make the journey to India we will gladly attend these meetings on their behalf and report back on exactly what was discussed. 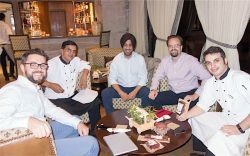 By generating business meetings in India we do more than just set up contacts for our clients. We can adapt our manpower usage on your behalf to represent your organisation and present your products at trade fairs, exhibitions and the offices of potential clients to give you a presence in the Indian market. We offer our clients a service that is more than simply generating business meetings in India for them. We provide a full business-to-business relationship-building service that can develop contacts, supply lines and sales opportunities and is as adaptable as your needs demand.